So when I finally finished reading it, it left me with that overbearing sense of, "Well, I liked it, but god that was such a bitter sweet romance." And the weird thing was I thought I would get over that feeling, but I haven't. It's told in first person by Theseus Cassio Lowood, or Cas for short, who kills ghosts for a living and can't help moving a lot. He's witting and is really entertaining. His mom and he travel all around the world looking for ghosts that he can slay with his sword after his father died. That is, until he meets Anna. At first I didn't get the whole concept of how he kills the ghosts, but I can assure that by the second chapter you might be thoroughly freaked out. He meets Thomas, a kid at his school who can read minds, and Carmel, the queen bee who joins his group of make-shift helpers. There are a couple other interesting characters that I wished Blake talked about more, but it's mostly the teenagers that hold this book up. 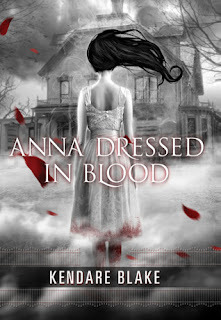 I think that despite its sometimes weird death scenes and a bittersweet romance (take that as you will) Anna Dressed in Blood holds its own. The writing is wonderful, it's completely original and guaranteed to be interesting enough that you won't be able to put it down.